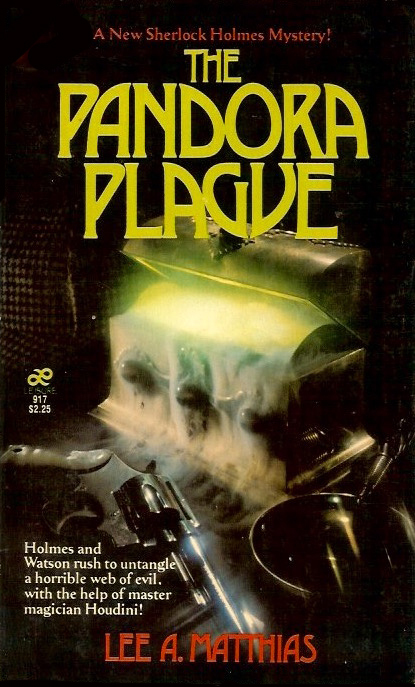 The Pandora Plague by Lee A. Matthias was first published as a mass market paperback from Leisure Books (below). Because of financial problems, the publisher only gave it a limited release. It later appeared as a trade paperback from Unicorn Press cut down by 8000 words. The author self-published a revised and expanded 3rd edition in 2009. The theft of a seemingly innocuous pocket watch, and the appearance of a small and mystifying heavy box, began Sherlock Holmes' most challenging case. In an attempt to open the box, Holmes requested the presence of master magician Harry Houdini. Soon, a series of puzzling events accelerated into a crisis of shocking importance, and Holmes, Houdini and Dr. Watson were drawn into the evil machinations of a hideously sinister plot. Holmes' abilities were pushed beyond their limits, and a startling discovery by Madame Curie told the great detective that the world's fate rested in his hands!